This has been a highly anticipated release from Cascade Barrel House. I would expect these bottles to go pretty quick. Certainly an event not to miss! From Press Release - It's here! 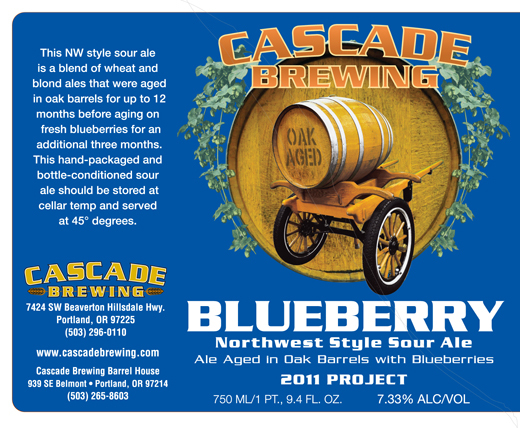 The release of Blueberry in bottles will be this Thursday, March 22 at 4:30 PM. The blenders will be on hand at "Blue Thursday" to answer questions, and we'll also have a 1/4 bbl of the original 2010 Blueberry on tap for comparison, plus a little of the Shrieking Violet. The 2011 Blueberry is a blend of wheat and blond ales that were aged in oak barrels for up to 12 months before aging on fresh blueberries for an additional three months. Bottles sell for $17 and are available at the Barrel House, the Raccoon Lodge and online. Our Blue Thursday event will feature food specials as well, including a lovely Blueberry Spring Salad, a spring mix tossed in our tart blueberry sourgrette with dried blueberries, dried cranberries, toasted hazelnuts & red onion, topped with crumbled goat cheese ($5, add smoked chicken for $2). We'll also be serving Barrel House Blueberry Blintz, a handcrafted cheese & dried blueberry filled blintz topped with fresh blueberry/blueberry sour beer sauce, chopped banana & a dust of powdered sugar ($3).